Thirty unique NPCs native to the myriad nations of Golarion, with illustrations, histories, complete stat blocks, and special boons for PCs who befriend them. While they bear flavour and history tied to their homelands, all 30 NPCs may appear in any part of the world, and in any setting - use them as mentors, allies, cohorts, or sworn enemies of your PCs. More than 50 nameless NPC stat blocks, custom designed for maximum utility in your game, including raiders from the Lands of the Linnorm Kings, Katapeshi slavers, spider-riding goblins Gillmen knife fighters, and evil cultists. Whether you use them as bosses in low-level adventures or minions for high-level enemies, you'll save yourself hours of work by putting your own names and faces over these premade NPCs. Seven adventurer PCs played by Paizo staff members, presented as NPCs with illustrations, histories, stat blocks, and player boons. Use one as a quick premade PC, or drop them all into your campaign as a rival adventuring group! 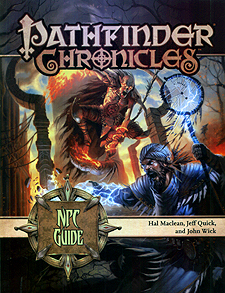 Pathfinder Chronicles: NPC Guide is intended for use with the Pathfinder Chronicles campaign setting, but is suitable for any setting using the Pathfinder Roleplaying Game or the 3.5 edition of the world's oldest roleplaying game.